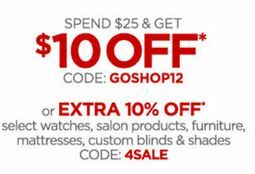 Save $10 off a $25 purchase at JCPenney now through August 6th. Just print this coupon for $10 off a $25 purchase of select original, regular, sale and clearance-priced apparel, shoes, accessories, fine jewelry, home, furniture, mattresses, custom blinds & shades – valid in-store OR shop online with the code 4SALE at checkout to get $10 off $25. Buying more than that? You can also save 20% off any purchase under $100 OR save 25% off $100 or more ONLINE ONLY with promo code 4SALE. (*NOTE the $10/$25 coupon is a better deal if you’re spending under $50 (pre-tax). If it goes over $50 (pre-tax), you’ll want to use 4SALE).